Is a liquid applied ready to use elastomeric membrane for tile and stone installation. Excellent for interior and exterior substrates in commercial and residential applications. Manufactured with a mixture of latex polymers and chemical additives to produce a high quality product. 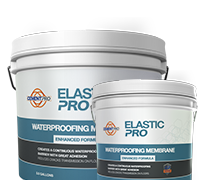 ELASTIC PRO creates a continuous waterproofing barrier with great adhesion and reduces crack transmission in tile and stone floors. ELASTIC PRO forms a smooth, uniform surface over walls, floors and ceilings. Can be used as slab on grade moisture vapor barrier under all types of floor coverings. Recommended on substrates for protection to water migration and for load bearing thin set tile and stone installation. Also could be used as anti-fracture membrane used to prevent shrinkage or non-structural cracks up to 1/8 in (3 mm). It bonds directly to metal drains, PVC, stainless steel and ABS drain assemblies. Use for residential and commercial applications. Suitable for waterproofing pools, sewer, cellar, balconies, spas and water features.